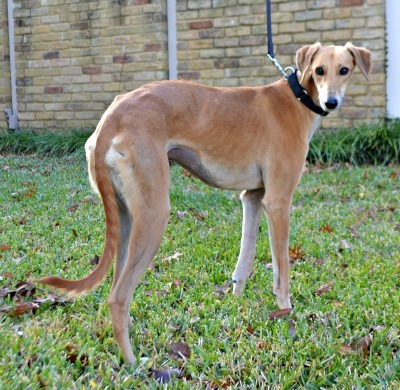 Sedona is an approximately 1 1/2 year old fawn female found as a stray in Itasca, TX. She is severely underweight at only 38 pounds and also has an injured left front leg. She is currently being medical evaluated by GALT's vets at VCA Preston Park Animal Hospital. Sedona has passed an initial cat test and will move to a foster home with cats after she finishes her medical procedures. Sedona's leg proved to be a chronic fracture of her left wrist. Surgery was performed by Dr. Doug Lange of the Dallas Veterinary Surgical Center on October 22, 2015. Sedona is receiving weekly bandage changes to her splint and follow up x-rays are estimated for approximately December 15, 2015. She is being kept very quiet in her foster home during this time. X-rays were taken on December 16, which showed her leg to be healed. She is being leashed walked for several weeks, and as with most fractures with repairs, the screws and plate may have to be removed if irritation occurs at a later date. 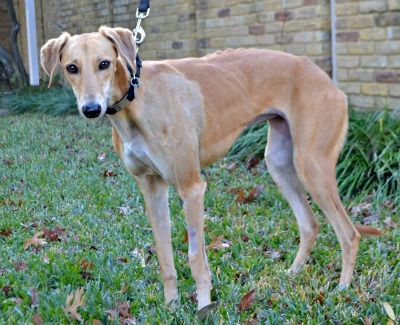 Sedona has now completed all her medical procedures and is ready to find her forever home!